We’re forever calling out magazines for their disastrous attempts at using Photoshop to enhance fashion photography, but Vogue China amazed the heck out of us this month. 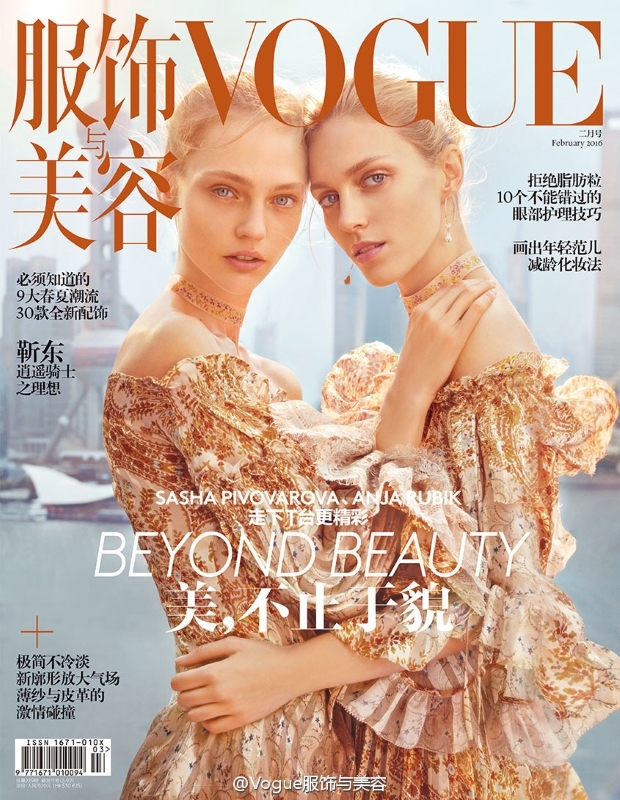 The magazine produced a warm, breezy and refreshing cover for February 2016, enlisting beauties Sasha Pivovarova and Anja Rubik to cover the issue, which was lensed by Chen Man. The girls each wear an ethereal creation by Etro while standing before the dramatic landscape of Shanghai. Or did they? Our forum members were left positively startled. “Stunning cover! Sasha and Anja both look so gorgeous!” Nepenthes praised straight away. “What a gorgeous cover, the light is just perfection, they look angelic. Chen Man is always a great welcome for them, her covers are great!” approved Miss Dalloway. “If it’s true, then they did an amazing job at putting them together. Unlike Mert & Marcus’ recent Photoshop disasters,” replied an amazed russianelf. “Holy cow! They Photoshopped Anja on the other girl? That is amazing work…I wouldn’t have guessed it!” fiqary raved. “Very impressed by the work they did combining those images. If we were not given proof that they were shot on separate occasions, I doubt anyone would have guessed it. The end result is so seamless and subtle—not to mention that it is really just an appealing image overall,” chimed in a dumbfounded Luxx. See the evidence and show Vogue China some more love by voicing your praise here.